As a middle-class white kid growing up in suburbia in the 80’s, I formed an instant bond with a few Brooklyn kids who had their own brand of punk-rock hip-hop, the Beastie Boys. So when I saw this label on a bottle at Hi-Time Wine in Costa Mesa, I didn’t even think twice about buying it. Any brewery who had the puntastic sense of humor to name themselves after my childhood favorite band was alright in my book. Later, when I got home and was putting my loot into the beer fridge, I noticed that the Yeastie Boys are based in New Zealand. So I headed over to the computer, looked up their website and saw that their blog is called “Swill Communication“, (the blog looks like it was abandoned in 2009, but the name still rocks.) Another brilliant Beastie Boys reference pun, so I was definitely on board with the brewery, but that about the beer? Pot Kettle Black is our multi-award winning ‘Black IPA’ (that some call a ‘Hoppy Porter’). The different names convey the fact that this beer is a contradiction of styles: fresh and hoppy, yet dark and rich. Most importantly it is mindbendingly delicious and a complete original. 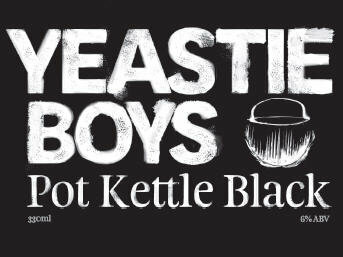 Like all Yeastie Boys beer is is painstakingly crafted by people who love beer, then conditioned to optimum ripeness, before making its way into a bottle and then to your hands. Now take the next step and enjoy with thoughtful consideration. Brewed in one of the southernmost breweries in the world, this ale is like a spring thunderstorm: dark, breezy, exhilarating and unsurprisingly wet. It’s near black and malty rich, yet is also joyously hoppy ~ a juxtaposition of beer styles that we call “Pot Kettle Black”. Enjoy it with your favourite friends and great music. The stage was set for me to “Fight… For My Right… To…” finally drink this beer that I’d been anticipating ever since my trip to the shop. I had my glass, my camera, and my bottle opener. Next up, pop the top, pour the beer, snap the photo, and start partying. As you can see it pours a deep dark black with a pretty significant head. I couldn’t even get the whole 11.2 ounces into the glass. I had to wait for the head to dissipate a bit before topping off. It has a malty nose which matches the color of the beer. Kind of a rich roasted coffee smell. So when I took my first sip and got a blast of hops I was pleasantly surprised. I had read about the beer and they compared it to a Black IPA so I shouldn’t have been that surprised, but I was. This is a fantastic beer. Totally in the flavor profile that I enjoy. It’s hoppy, malty, big, bold, in your face and makes me want to fight for my right to drink another one of these. I have no idea how much I paid for this one, but it doesn’t really matter. I’m going back to pick up another bottle first chance I get. This is a winner in my book. 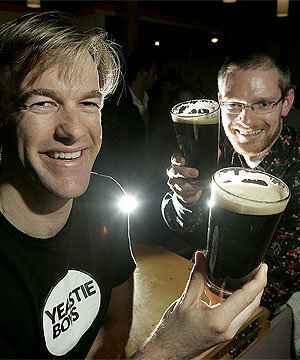 Way to go Yeastie Boys! 5 beer soaked caps. 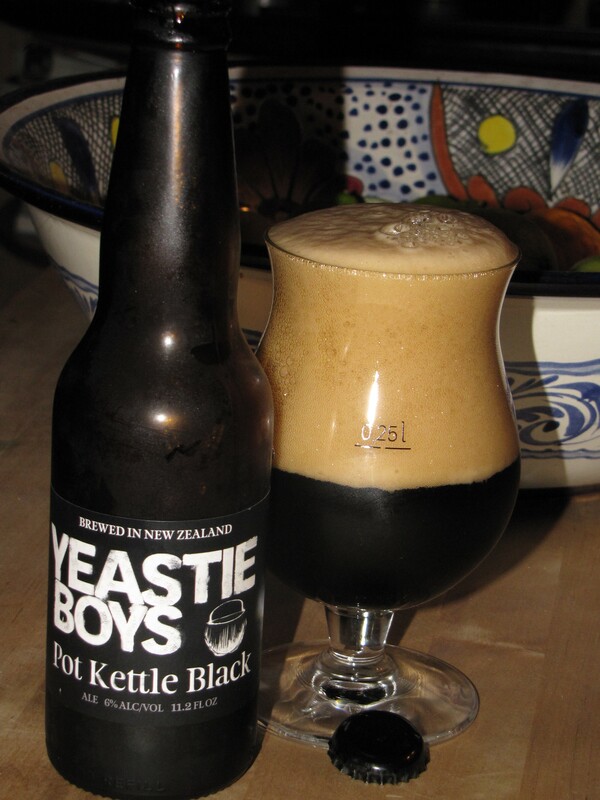 This entry was posted in American, Black, IPA, Porter, Review and tagged American Porter, Beastie Boys, Black IPA, New Zealand, Pot Kettle Black, Yeastie Boys by Erik. Bookmark the permalink.